Hey, I’ve got a great idea! Let’s start a new project! I drew up an idea for a dedicated sharpening bench last week. Marilyn pointed out that the top should really be waterproof (as I’m going to be using waterstones), so I’ve been watching craigslist for a cheap piece of marble or granite. One showed up that looked like it would work (26′ by 42″) and it was pretty cheap ($60), so I went and picked it up this morning. I wish it didn’t have the uneven edge on the left side. I looked into what it takes to cut and polish granite and it looks like a lot of work and mess. I may try cutting it myself, both because I know it will always bug me and because I eventually want to remodel my kitchen one day. I stopped by the Home Despot on the way back and picked up the rest of the materials I’ll need. 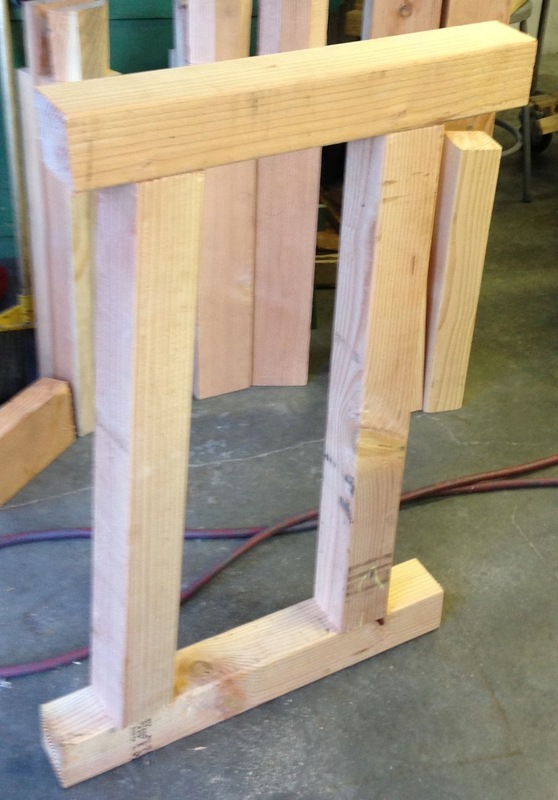 3 green Douglas Fir 4″ x 4″ posts and some wood to make a drawer. I’d rather use something nice for this, but at $7 each it’s hard to beat. 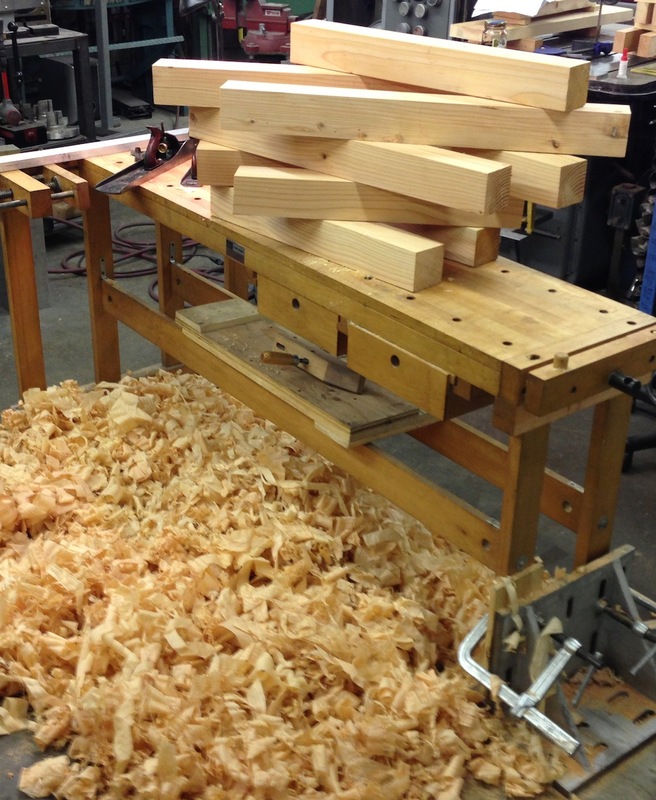 I rough cut all of the fir for the base to length, when I realized I’d miscalculated the material slightly – I didn’t have enough for the stretchers to go between the two trestles. Actually, I’m glad because I think I’d rather use 4″ x 6″ material for that. 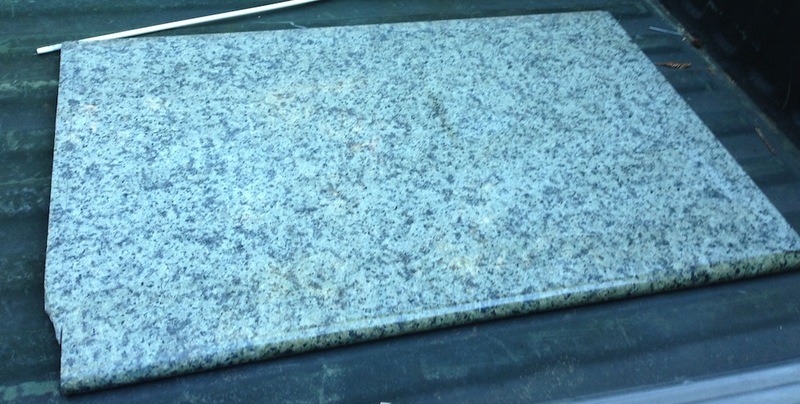 One more run to the hardware store tomorrow morning – maybe I’ll see if they have a diamond blade for cutting granite. while I’m there. This is a rough mockup of one end of the base. It will be about 7″ shorter than this of course because the two upright legs will be tenoned into the horizontal parts. I’m aiming for this to end up the same height as my new workbench. I started processing the stock to size. It took maybe two hours to get this all true on two adjacent faces. I still need to plane it to thickness (oh, joy!) before I can start cutting the joinery. I did this with my #5 and #8 planes. The blade in the joiner was getting dull, and has a nick in it from hitting knots. So first thing tomorrow (after feeding the dogs, cats and bunnies) will be another trip to the local big box store, then some sharpening, then I can finish preparing the stock and start on fitting the joints. I *think* I can get the base mostly done tomorrow if I really crank on it. Two feet, two top supports and four legs. Dang, it looks like I planed an off-cut too. Well, that’s embarrassing. Yes, that’s my aluminum winding sticks hiding in the background. The finish on my new fancy ones I made yesterday isn’t dry yet. Wow! That’s going to be a nice sharpening station. Nice piece of granite too. I hadn’t thought about looking on Craig’s list (DOH!). I love your “What happens in the garage .. stays in the garage” sign!